​﻿﻿CHAPTER FLAG PARADE requires an individual participant (Preferably a chapter officer) to walk across the stage during the State Leadership Opening Ceremony. This will allow the individual chapter to be recognized as STAR Events participating Chapters in the SLC. **The flag can be design by one participant or all chapter members to demonstrate their knowledge, skills, and ability to use their creativity to design a Flag for their chapter. **The flag will serve as a symbol of the Chapter. **It should represent the purpose and resolve of the Chapter; the flag will address the history and or future of the chapter and will tell a story based on colors chosen, design used and graphics presented. 1. 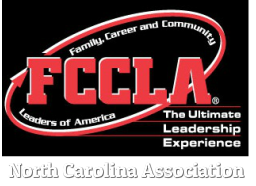 Any Nationally affiliated FCCLA chapter may contact Janet Johnson at Janet.Johnson@dpi.nc.gov regarding your Chapters interest. 2. The Chapter flag must be designed and created prior to attending the State Leadership Conference.